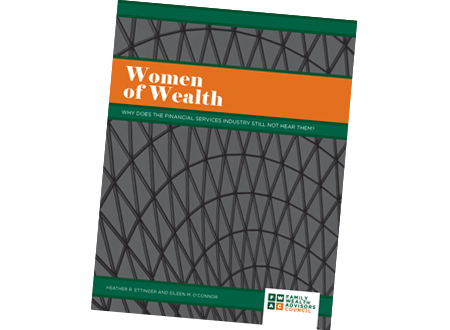 The members of the Family Wealth Advisors Council are recognized leaders on women’s financial needs. Through our research, authorship and speaking engagements, we share our firm belief that women today cannot be treated collectively, but rather, understood individually. FWAC members are committed to thought leadership in our industry around women’s needs. We have authored highly informative papers addressing some of the pressing concerns of women – the Women of Wealth national study paper, Women of Wealth: Why Does the Financial Services Industry Still Not Hear Them?, and Caught in the Middle: How Does The Sandwich Generation Woman Not Get Squeezed?. 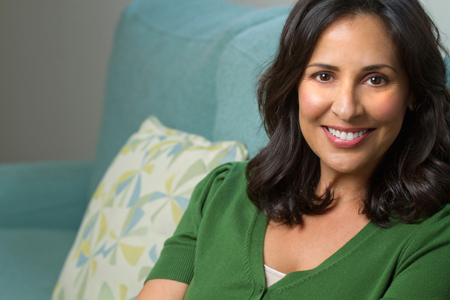 Prudential Research Study, “Financial Experience and Behaviors Among Women” (2010-2011), Click to view study here. Women of Wealth: Why Does the Financial Services Industry Still Not Hear Them? The first research paper from the Family Wealth Advisor Council’s 2012 Women of Wealth Study, “Women of Wealth: Why Does the Financial Services Industry Still Not Hear Them?” is available for license and interested parties should contact Eileen O’Connor of Hemington Wealth Management for more information at eileen.oconnor@hemingtonwm.com. Women of Wealth: Caught in the Middle: How Does The Sandwich Generation Woman Not Get Squeezed? 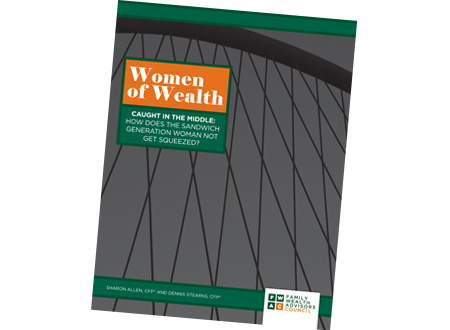 The second research paper from the Family Wealth Advisor Council’s Women of Wealth Study, “Caught in the Middle: How Does The Sandwich Generation Woman Not Get Squeezed?” is available to purchase and download as an ebook at the Amazon Kindle Store. For more information regarding this study, please contact Sharon Allen at Sharon@SterlingWealthManagement.com or Dennis Stearns at dstearns@stearnsfinancial.com. Women of Wealth: What do Breadwinner Women Want? 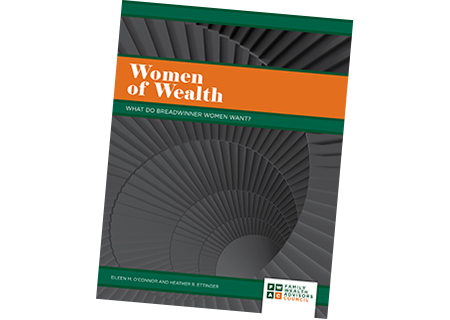 The third research paper from the Family Wealth Advisor Council’s Women of Wealth Study, “Women of Wealth: What do Breadwinner Women Want?” has just been released. Founded in 1981, the Family Wealth Advisors Council (FWAC) is a national network of independent, fee-only wealth management firms that collectively manage over $5.5 billion in assets. If you would like to have one of our Family Wealth Advisors talk to you about a news article, speaking opportunity or if you have an interest in engaging one of our fee-only advisors to help you with financial planning and investment advice, please visit our contact page to get in touch with us. Copyright 2019 Family Wealth Advisors Council. All Rights Reserved.